Edna Mae Oliver, Donald Meek, Shirley Temple and George Murphy in "Little Miss Broadway." Shirley Temple and Robert Young in "Stowaway." Shirley Temple launching her autobiography "Child Star." 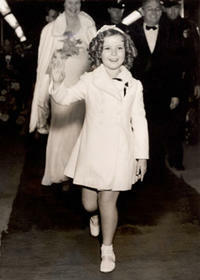 Shirley Temple and Jean Pierre Cassel at the party celebrating the investiture of new-elected US president Ronald Reagan. Shirley Temple at the premiere of "Wee Willie Winkie" in Hollywood, June 26, 1937.